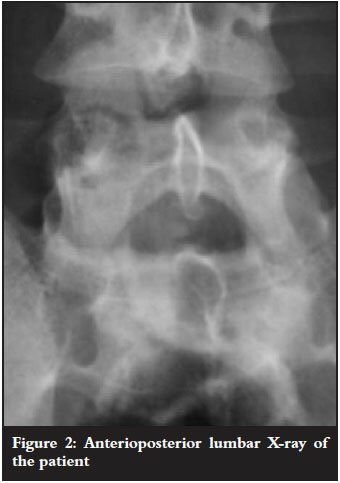 Osteochondromas found in the vertebral column are rare; those in the lumbar spine even more so. We discuss a case of an osteochondroma in the lumbar spine causing spinal compression - giving symptoms of weakness in the right leg, and in the L5 and S1 distribution. 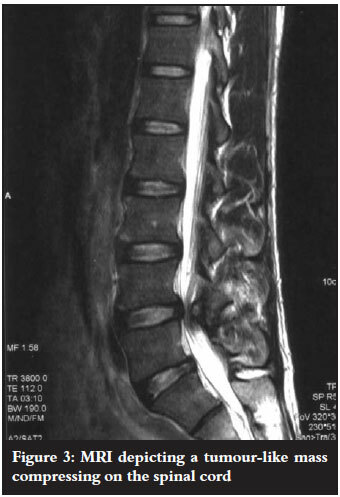 These symptoms are usually associated with a disc lesion. JM, a 37-year-old male, presented to our clinic with progressive weakness in the left leg of a few months' duration. The lumbar X-rays revealed no abnormalities (Figures 1 and 2). On examination, there was weakness in the L5 and S1 distribution on the right side. Our initial diagnosis was that of a disc lesion and an MRI was ordered. 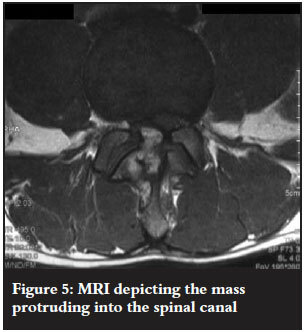 The MRI revealed a mineralised bony mass protruding from the lamina of the vertebral body of L4 with a cortical edge compressing the L5 and S1 right spinal roots. Cauda equina was present (Figures 3-7). 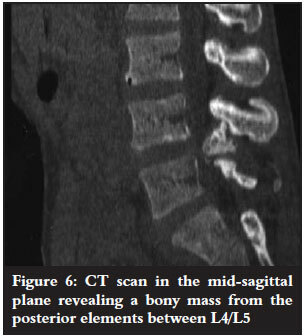 The bony mass had a cartilage cap and the tentative diagnosis of an osteochondroma was made. The patient was not known to have any other exostoses. 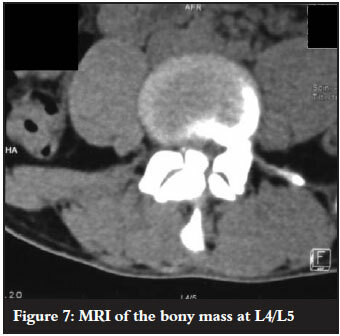 Intra-operatively a bony mass with a cartilage cap was found, compressing the L5 and S1 spinal root. The mass was excised and sent for histology. A laminectomy was done. The histology confirmed an osteochondroma. 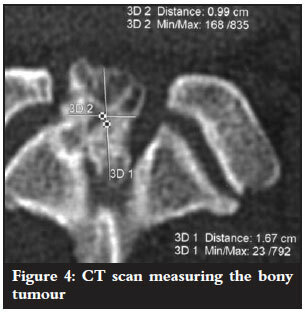 Bone scintigraphy findings correlate directly with the degree of enchondral bone formation and metabolic activity. 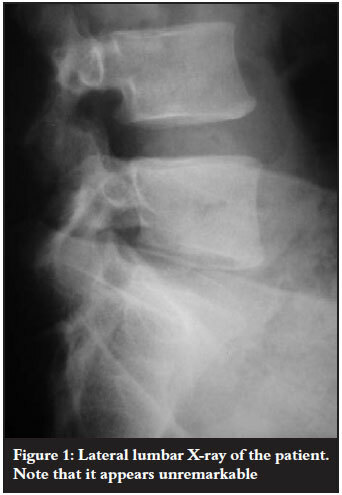 Osteochondromas of the vertebrae are rare but should be considered as a cause for spinal nerve root compression. The gold standard for diagnosis is an MRI, and surgery is a successful form of treatment.